Born in 2017, this outgoing pig came to Best Friends in summer 2018 from another sanctuary. Found a stray, Cornelia is black with white stripes. She has the cutest white strip on her head and striking eyes. 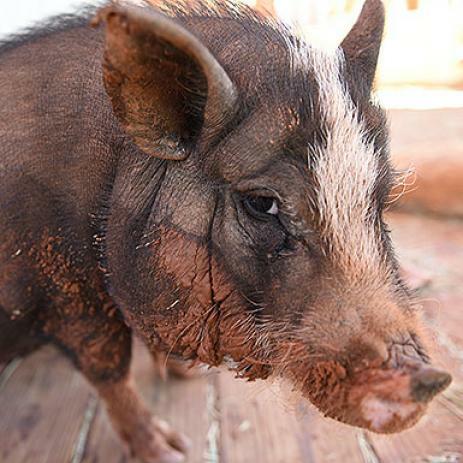 Precious and playful; she loves to roll in her mud bath, then run around trying to get mud on other pigs. Make no mistake though, while active and energetic Cornelia loves to nap in the shade and get belly rubs. Cornelia needs a home with other pigs and a family who will appreciate her goofiness and give her lots of room to run and play.